The importance that Dr. B.R. Ambedkar had in the shaping of modern India should not be forgotten. He led millions of the oppressed to a life of self-respect, dignity, and responsibility. Babasaheb always stressed the importance of better education, so that our position in society can be uplifted. It was he who was primarily responsible for the Constitution, adopted after India became independent. Babasaheb began the revival of Buddhism in India that has grown tremendously after his death, and continues to grow today among his countless followers. This book briefly outlines the history of his life, showing how he overcame all the difficulties facing the oppressed in India, to become one of the greatest men of modern times. In due course, Bhim passed his Matriculation Exam. He had already come to the attention of some people interested in improving society. So when he passed the exam, a meeting was arranged to congratulate him – he was the first ‘untouchable’ from his community to pass it. Bhim was then 17 years old. Early marriage was common in those days, so he was married to Ramabai the same year. He continued to study hard and passed the next Intermediate examination with distinction. However, Ramji found himself unable to keep paying the school fees. Through someone interested in his progress, Bhim was recommended to the Maharaja Gaekwad of Baroda. The Maharaja granted him a monthly scholarship. With the help of this, Bhimrao (‘rao’ is added to names in Maharashtra as a sign of respect) passed his B.A. in 1912. Then he was given a job in the civil service – but only two weeks after starting, he had to rush home to Bombay. Ramji was very ill, and died soon afterwards. He had done all he could for his son, laying the foundations for Bhimrao’s later achievements. He had no choice. After only eleven days in his new job, he had to return to Bombay. He tried to start a small business there, advising people about investments – but it too failed once customers learned of his caste. In 1918, he became a lecturer at Sydenham College in Bombay. There, his students recognised him as a brilliant teacher and scholar. At this time he also helped to found a Marathi newspaper ‘Mook Nayak’ (Leader of the Dumb) to champion the cause of the ‘untouchables’. He also began to organise and attend conferences, knowing that he had to begin to proclaim and publicise the humiliations suffered by the Dalits – ‘the oppressed’ – and fight for equal rights. His own life had taught him the necessity of the struggle for emancipation. Because of his experience of the humiliation and injustice of untouchability, he knew that justice would not be granted by others. Those who suffer injustice must secure justice for themselves. Mahad Municipality had thrown open the local water tank four years earlier, but so far not one ‘untouchable’ had dared to drink or draw water from it. Babasaheb led a procession from the Conference on a peaceful demonstration to the Chowdar Tank. He knelt and drank water from it. After he set this example, thousands of others felt courageous enough to follow him. They drank water from the tank and made history. For many hundreds of years, ‘untouchables’ had been forbidden to drink public water. When some caste Hindus saw them drinking water, they believed the tank had been polluted and violently attacked the Conference, but Babasaheb insisted violence would not help – he had given his word that they would agitate peacefully. Babasaheb started a Marathi journal Bahishkrit Bharat (‘The Excluded of India’). In it, he urged his people to hold a satyagraha (non-violent agitation) to secure the right of entry to the Kala Ram Temple at Nasik. ‘untouchables’ had always been forbidden to enter Hindu temples. The demonstration lasted for a month. Then they were told they would be able to take part in the annual temple festival. However, at the festival they had stones thrown at them – and were not allowed to take part. Courageously, they resumed their peaceful agitation. The temple had to remain closed for about a year, as they blocked its entrance. After the war Babasaheb was elected to the Constituent Assembly to decide the way jthat India – a country of millions of people – should be ruled. How should elections take place? What are the rights of the people? How are laws to be made? Such important matters had to be decided and laws had to be made. The Constitution answers all such questions and lays down rules. 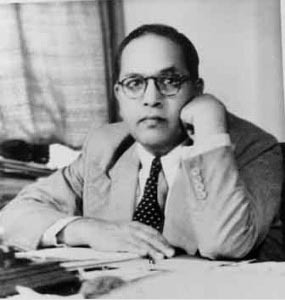 Babasaheb resigned from the Government in 1951. He felt that as an honest man he had no choice but to do so, because the reforms so badly needed had not been allowed to come into being. For the next five years Babasaheb carried on a relentless fight against social evils and superstitions. On October 14, 1956 at Nagpur he embraced Buddhism. He led a huge gathering in a ceremony converting over half a million people to Buddhism. He knew that Buddhism was a true part of Indian history and that to revive it was to continue India’s best tradition. ‘Untouchability’ is a product only of Hinduism. Only seven weeks later on December 6, 1956 Babasaheb died at his Delhi residence. His body was taken to Bombay. A two-mile long crowd formed the funeral procession. At Dadar cemetery that evening, eminent leaders paid their last respects to him. The pyre was lit according to Buddhist rites. Half a million people witnessed it. Thus ended the life of one of India’s greatest sons. His was the task of awakening India’s millions of excluded and oppressed to their human rights. He experienced their suffering and the cruelty shown to them. He overcame the obstacles to stand on an equal footing with the greatest men of his time. He played a vital role in forming modern India through its Constitution.